Increasingly, and to a greater degree than most national jurisdictions, France encourages and favours private arbitration as the normal and usual method for the resolution of disputes arising from international economic relations. 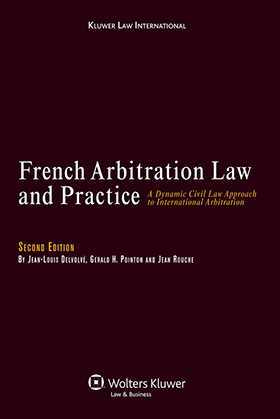 In this new edition of the standard English-language work on French arbitration law and practice, the authors examine this trend as rules and practices developed in international arbitration have taken hold in French domestic arbitration and vice versa. Accordingly, the authors present the French arbitral process as one entire system of dispute resolution, which consists of various stages from the formation of the arbitration agreement to enforcement of the award, without dividing the subject into the formally distinct parts of domestic and international arbitration. relationship of French Law with the New York Convention, 1958. At each stage the authors emphasize variations arising in international arbitration. The presentation also takes account, with comments at relevant points, of the influential 2006 Draft Reform of the Comité Français de l’Arbitrage. A highly useful annex reprints relevant French legislation with English translation, as well as the texts of major international arbitration conventions and an extensive bibliography. The objective of the book is to present a modern and efficient arbitration system, not only to readers who are encountering it for the first time, but also to those who, although well-versed in it, might benefit from a text in English, with the comparisons to common law provisions such an undertaking entails. Any practitioner or academic interested in the field of international arbitration and the enforcement of foreign awards will welcome this very useful and informative work. Introduction. Part I: The Concept and Scope of Arbitration: The Nature of Arbitration in French Law. 1. A Brief Survey of the History of Arbitration in France. 2. French Arbitration Law Today and its Sources. 3. What Is Arbitration in French Law? Part II: The Arbitral Process. 1. Institution of Arbitral Proceedings. 2. Arbitral Proceedings. 3. Arbitrators and the Law. Part III: Arbitral Awards: Their Essential Features and Effect; Enforcement by the Courts; Challenges. 1. Making an Arbitral Award: Its Characteristics and Legal Effect. 2. Challenge of Arbitral Awards in French Cours d’Appel. Part IV: Satisfaction of Awards by Processes of Execution: Enforcement of Awards against the French State or Foreign States. 1. Enforcement of Awards against the French State or French Public Law Bodies. 2. Enforcement in France of Awards against Foreign States and Entities under their Control. Annexes: 1. Extracts from the French Civil Code. 2. Extracts from the Code of Civil Procedure (Articles 1442–1507). 3. Extracts from the Code of Civil Procedure (Basic Principles for the Conduct of Litigation). 4. The Convention on the Execution of Foreign Arbitral Awards (The Geneva Convention, 1927). 5. The Convention on the Recognition and Enforcement of Foreign Arbitral Awards (The New York Convention, 1958). 6. The European Convention on International Commercial Arbitration (The European Convention Geneva, 1961). 7. Bibliography. 8. Index.